Despite Lagonda's commitment to the war effort (manufacturing specialised aeroplane components as well as general ordnance etc), their chief engineer W.O. Bentley - ably assisted by W.G. Watson and Donald Bastow - began work on a new car in early 1944. Conceived as a sports saloon, the resultant design boasted an innovative cruciform-braced chassis equipped with all-round independent suspension (coil-and-wishbone front / torsion-bar rear) and hydraulic drum brakes (inboard at the back). Powered by an equally advanced DOHC straight-six engine featuring hemispherical combustion chambers, its flowing lines were the work in part of Frank Feeley. Unveiled to an enthusiastic press in September 1945, production plans for the `2.5 Litre' fell foul of the prevailing `export-or-die' atmosphere with Lagonda failing to negotiate sufficient steel supplies for such a low volume, home market product. Unable to recover financially, Lagonda was bought by industrialist David Brown in 1947. Merged with Brown's other recent purchase Aston Martin, the two companies operated out of the latter's Feltham premises. In addition to donating its powerplant to the nascent Aston Martin DB2 programme, the `2.5 Litre' was developed in its own right. Fitted with a David Brown S430 four-speed synchromesh gearbox, rack and pinion steering and hypoid back axle, it reappeared at the October 1949 Earls Court Motor Show as the DB Lagonda 2.6. Very highly regarded in its day but somewhat expensive, the model reputedly accounted for just 511 sales (386 saloon and 125 drophead coupes). Finished in maroon with beige leather upholstery, this particular example is variously described by the vendor as being in "restored" (coachwork, electrical equipment), "renewed" (paintwork, interior trim) or "refurbished" (engine, four-speed manual column-change gearbox) condition. While he goes on to say that: "My father purchased the Lagonda in 1998 and then spent the next five years restoring it. The car was completely stripped down and all parts checked or refurbished as he felt necessary. Once completed, the drophead coupe took part in various Lagonda Club rallies in the UK and Europe including Switzerland, Austria and France. 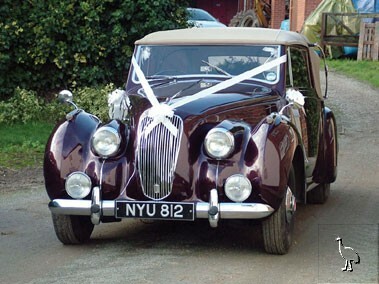 I believe that the car won some Lagonda Club prizes on the events and it has also been hired out for weddings".